Yes the one on the right you could probably call a “t-shirt” dress but things can live in multiple categories. Images via Everlane and Aritzia. It’s officially hot out where I live, according to my dermatologist, who told me this week that it’s now summer (he’s a doctor, so who am I to fight his words?). With this heat has come a fresh new energy to the world, specifically, a sartorial one. I walk down the streets of New York City quite visually excited, the way I imagine anyone attracted to scantily clad women would. But instead of flesh, what I am looking at is something different—namely, what said women are wearing. And they are wearing sack dresses. The sack dress, I will make clear lest you scream too loudly at me and deafen my delicate ears, is hardly new. Shift dresses and slip dresses are longtime summer staples (like the sack, the slip dress is also being sold at every outlet right now, though most of us can’t wear that to work). But I have been seeing this shapeless style much more ubiquitously this summer, and have even purchased it myself. 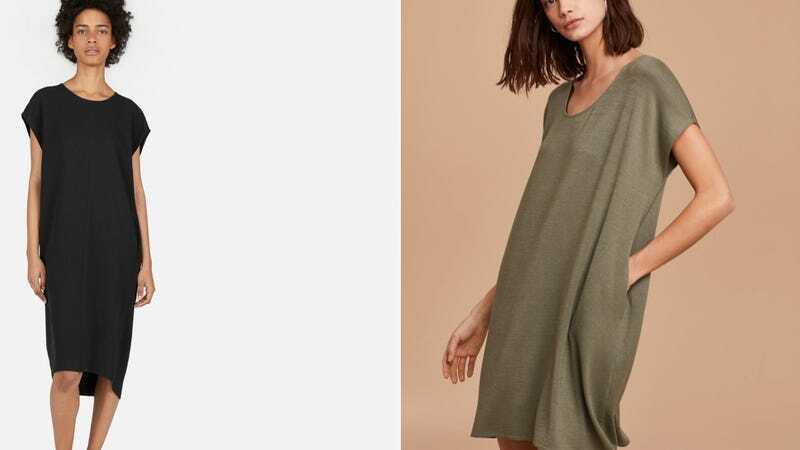 I’ve been noticing styles have gotten looser, as if lines are embracing the Eileen Fisher in their DNA and quite literally going with the flow. Want to wear something with a minor sleeve, that’s basically a long t-shirt that gives you enough space at the armpit that you don’t pit out? Something with a very minimal pattern, if a pattern at all? This is the outfit for you and apparently every woman walking around New York City, searching for something to transition them from cold office job in the day, to a sticky night sitting outside with a cold bev. Sometimes, the sack dress goes poorly, as I have found in my shopping endeavors—a bag dress that looks good on one body will look very different on another body, just as the same is true for closely tailored clothing. Yes this one on the left is technically a “shirt” dress; again, okay? Images via Urban Outfitters and H&M. But the women around me seem to be getting past this hurdle, and the sack reigns supreme. Next up: an important blog on how every sack dress is getting paired with a version of this sandal.